Most of the year, Big Bend National Park is relatively empty. You will want to plan ahead though if you plan on camping. There are periods of the year that finding a campsite can be virtually impossible. Big Bend’s peak season runs from mid-November through the first week of January and then it picks back up again during Spring Break, which runs March through mid-April. If you haven’t reserved a spot and plan on camping during this season, you may be out of luck. 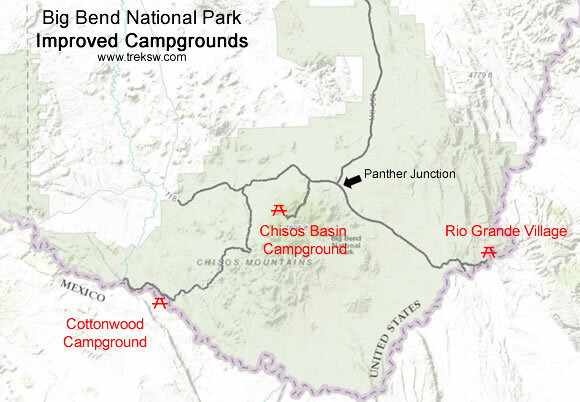 Below is a map showing the three major campgrounds in Big Bend. Keep in mind the time of year you’re heading out there. If its in the hot part of the year, Cottonwood Campground and Rio Grande Village, being at lower elevations down by the Rio Grande, will be exceptionally hot. Chisos Basin will be your best bet to beat the heat. Vice versa in the wintertime. Chisos Basin Campground – Elevation 5,401′ – 60 campsites – 7 group sites – The most popular campground in Big Bend National Park. Sits high above the desert floor in Chisos Basin, where the weather typically stays far milder. Rio Grande Village Campground – Elevation 1,850′ – 100 campsites – 4 group sites (25 RV sites at Rio Grande Village RV Campground) – Sits on the East side of the park near the Rio Grande River. The largest campground in Big Bend. Also offers the best options inside the park for RV camping. Cottonwood Campground – Elevation 2,169′ – 24 campsites – 1 group site – The smallest campground in Big Bend sits on the West side of the park near the Rio Grande River. Not suitable for larger RVs. Big Bend National Park – Backcountry Camping – Our comprehensive guide to backcountry camping in Big Bend National Park. Includes all of the designated primitive roadside campsites as well as backcountry zone camping rules.